Moore wants agreement that Section 30 Order is "preferred route to referendum"
Minister believe it would be helpful if he and the First Minister can agree a Section 30 order is regarded by both Governments as the "preferred route to a legal referendum". Scottish Secretary Michael Moore has said he hopes the First Minister will agree to give people in Scotland the certainty that comes with a legal, fair and decisive referendum when they meet in Edinburgh next Monday. A Section 30 Order can be used to devolve powers from Westminster to Holyrood and requires the approval of both Parliaments. Michael Moore said good progress has been made in recent weeks and that “we have already come too far to revert to a referendum that could land us all in the courts”. 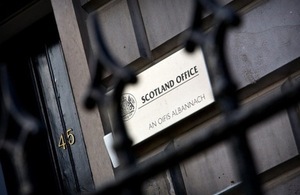 Following the publication of referendum consultation papers by both the UK and Scottish Governments in January it was agreed that the Scottish Secretary and First Minister should hold talks. The first of these meetings is scheduled for Edinburgh on Monday, February 13th. “On Monday, the First Minister and I will open talks on how we can deliver a legal, fair and decisive referendum for the people of Scotland. The Scottish people will not accept a referendum whose process and outcome will be open to legal challenge. “Good progress has already been made in the past few weeks. Both Governments agree that we want a referendum that is free from legal dispute and that produces a result that everyone accepts. “I think it would be helpful on Monday if we can agree that both Governments regard the Section 30 order as the preferred route to a legal referendum. There would still be a number of issues to discuss and resolve but it would send a strong signal that both Governments want to work together to make sure the referendum is legal. “It would be good to agree in principle that, if we can sort out the detail, a Section 30 Order, approved by both Parliaments, is what both Governments are aiming for.